The humble mango has rightfully earned its reputation as the King of Exotic Fruits. Each variety of mango has its own distinctive taste, texture, aroma, colour and size, making it suitable for eating out of hand or pulping, and for consumers of all ages. All mangos have a central stone or pit, which contains the seed. Typically, it is not always the sweetest or juiciest mango that can be found readily available on the shelves of a supermarket. This is because not all varieties travel well, or have the best shelf life. A common example of this would be the Tommy Atkins variety, which is probably one of the largest exported varieties, yet has a fibrous texture and comparatively bland taste. However, at MD, we specialise in the growing and procurement of a wide range of mangos, harvesting only tree-ripened fruit which is air-freighted to us, satisfying the needs of our clients whilst providing the best mangos in season. MD are one of the biggest growers, suppliers and importers of mangos into the UK. A sweet yellow-orange skinned mango that is juicy and rich in flavour. It is popular with ethnic communities who consider it to be the sweetest mango available, and can reach high prices on the International market as local demand in India is strong. An exclusive variety of mango imported from the Dominican Republic, this fruit has been marketed as a ‘Fun Size’ mango owing to its small size and sweet juicy flesh. A sweet and juicy fibrous mango with pale gold skin. This mango is often enjoyed by sucking on the juicy flesh. A small round-oval shaped mango that has a sweet aroma and taste. The flesh is firm but creamy in texture as it has fine fibers. The skin is predominantly yellow when ripe with a strong red blush. One of the larger varieties of mangoes with small pit offering greater flesh. The texture is creamy as the fruit is near fiber-less, but the flavour is mild. Keitt mangoes are a strong green colour with minimal red blush. Another large oval shaped mango similar to the Keitt variety but offering a richer flavour. Ripe Kent mangoes are green in colour with yellow undertones, and can develop a minimal red blush. Perhaps the second most popular Indian mango, the Kesar is a small kidney-bean shaped mango golden yellow in colour with green overtones. Whilst ripe mangoes are cultivated for their often sweet and juicy flesh, the raw mango has a sharp sour taste with firm pale flesh. It is most often used to make pickles, creating the perfect accompaniment to any Asian cuisine. A popular sea-freighted mango that has a sweet and mild flavour, with firm flesh as it is fibrous. This mango variety has a long shelf life, high tolerance for handling and strong defence against disease. 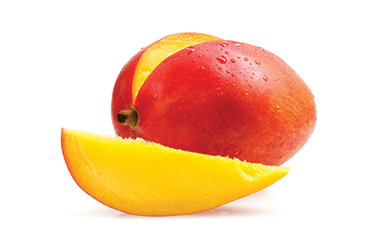 Although the mango is yellow-orange in colour, the red blush is dominant only allowing accents of the green-yellow skin to shine through.